If you've been following the development of the upcoming TimescaleDB 1.2 release in GitHub, you'll notice three new SQL functions for time series analysis: time_bucket_gapfill, interpolate, and locf. Used together, these functions will enable you to write more efficient and readable queries for time-series analysis using SQL. In this post, we'll talk about why you'd want to use time buckets, the related gap filling techniques, and how they’re implemented under the hood. 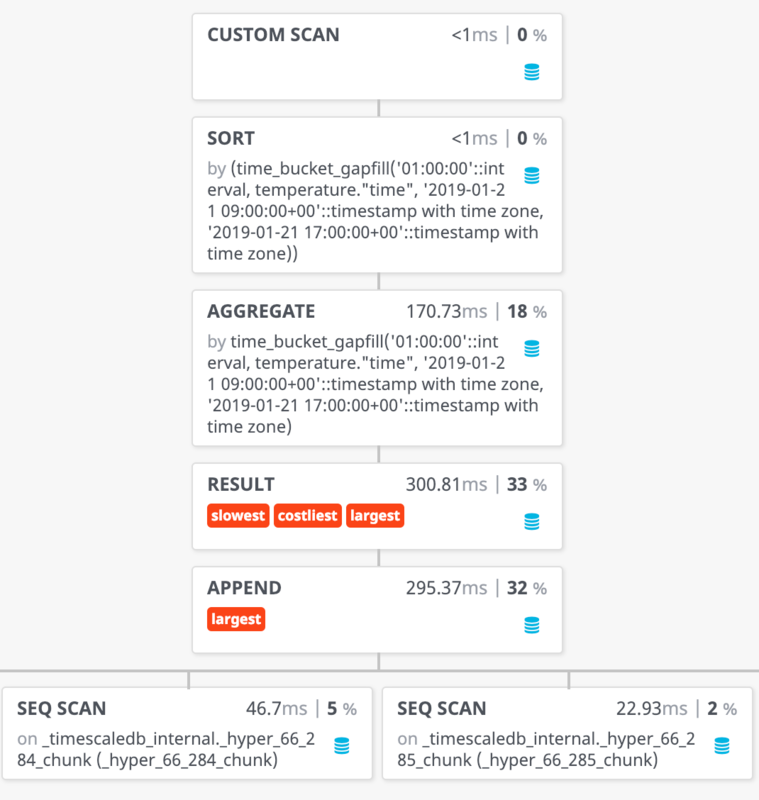 Ultimately it's the story of how we extended SQL and the PostgreSQL query planner to create a set of highly optimized functions for time-series analysis. Many common techniques for time series analysis assume that our temporal observations are aggregated to fixed time intervals. Dashboards and most visualizations of time series rely on this technique to make sense of our raw data, turning the noise into a smoother trend line that is more easily interpretable and analytically tractable. When writing queries for this type of reporting, we need an efficient way to aggregate raw observations (often noisy and irregular) to fixed time intervals. Examples of such queries might be average temperature per hour or the average CPU utilization per 5 seconds. The solution is time bucketing. The time_bucket function has been a core feature of TimescaleDB since the first public beta release. With time bucketing, we can get a clear picture of the important data trends using a concise, declarative SQL query. The reality of time series data engineering is not always so easy. Consider measurements recorded at irregular sampling intervals, either intentionally as with measurements recorded in response to external events (e.g. motion sensor). Or perhaps inadvertently due to network problems, out of sync clocks, or equipment taken offline for maintenance. We should also consider the case of analyzing multiple measurements recorded at mismatched sampling intervals. For instance, you might collect some of your data every second and some every minute but still need to analyze both metrics at 15 second intervals. The time_bucket function will only aggregate your data to a given time bucket if there is data in it. In both the cases of mismatched or irregular sampling, a time bucket interval might come back with missing data (i.e gaps). If your analysis requires data aggregated to contiguous time intervals, the time bucketing with gap filling solves this problem. time_bucket_gapfill for creating contiguous, ordered time buckets. interpolate to perform linear interpolation between the previous and next value. locf or last observation carried forward to fill in gaps with the previous known value. The new time_bucket_gapfill function is similar to time_bucket except that it guarantees a contiguous, ordered set of time buckets. The function requires that you provide a start and finish argument to specify the time range for which you need contiguous buckets. The result set will contain additional rows in place of any gaps, ensuring that the returned rows are in chronological order and contiguous. Note that one of the hours is missing data entirely and the average value is represented as NULL. Gap filling gives us a contiguous set of time buckets but no data for those rows. That's where the locf and interpolate functions come into play. The “last observation carried forward” technique can be used to impute missing values by assuming the previous known value. Linear interpolation imputes missing values by assuming a line between the previous known value and the next known value. Whether you chose to use LOCF, interpolation, or gap filling with nulls depends on your assumptions about the data and your analytical approach. Use locf if you assume your measurement changes only when you've received new data. Use interpolation if you assume your continuous measurement would have a smooth roughly linear trend if sampled at a higher rate. Use standard aggregate functions (without locf or interpolation) if your data is not continuous on the time axis. Where there is no data, the result is assumed NULL. If you chose to explicitly ORDER your results, keep in mind that the gap filling will sort by time in ascending order. Any other explicit ordering may introduce additional sorting steps in the query plan. Astute readers will note that our docs had previously contained some examples of these gap filling techniques using a different query. It used some tricks with generate_series and joins to achieve a similar effect but was verbose, limited in functionality, and challenging to write correctly. The new time_bucket_gapfill query is not only significantly more readable, it’s less error prone, more flexible with regards to grouping, and faster to execute. How does TimescaleDB achieve this? Under the hood, these are not ordinary functions but specially-optimized hooks into the database query planner itself. The time_bucket_gapfill function inserts a custom scan node and sort node (if needed) into the query plan. This creates ordered, contiguous time buckets even if some of the buckets are missing observations. The locf and interpolate functions are not executed directly but serve as markers so that the gap filling node can track the previous and next known values. The result: a semantically cleaner language for expressing time-series analysis, easier to debug, more performant, and saves the application developer from having to implement any of these tricks on the application side. This is another example of how Timescale is extending PostgresSQL for high-performance, general purpose time-series data management. In the meantime, if you’re interested in learning more about gapfilling, check out our docs. And if you are new to TimescaleDB and ready to get started, follow the installation instructions. We encourage active TimescaleDB users to join our 1900+ member-strong Slack community and post any questions you may have there. Finally, if you are looking for enterprise-grade support and assistance, please let us know.